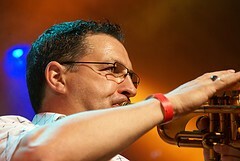 Don works as a Professional Trumpet Player and Teacher, as as such, has the required knowledge to help other musicians find the perfect instrument for them. He has worked with many well known Bands and Orchestras, and still works with Professional Bands across Europe performing on TV and Radio, as well as many live performances. You can make a personal, private session with Don by appointment. We aim to provide our customers with a professional service with a variety of good quality products sourced from some of the best selling and best quality musical instruments on the market - many of these products are exclusive at Don's Music in Germany, and as such, we aim to supply our customers with something unique and exclusive. Don's Music is presently situated in Homburg, Saarland, but will soon be moving premises to enable us to visit more people and show them our exclusive products.